Where does the story begin? Perhaps with a pair of shoes? A computer? Or a man in a hat? Roll the dice and find out. This simple Storyteller Set is a great way to exercise the imagination. 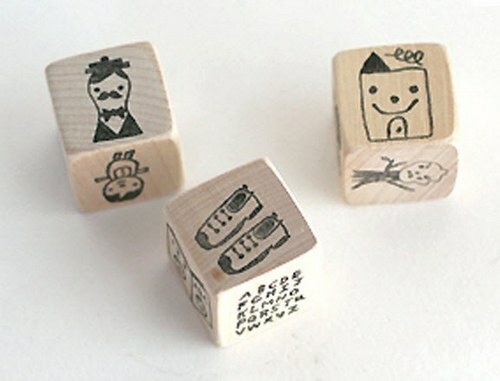 Each set includes three wooden dice featuring a range of images and a notepad to write your story. This game is terrific in that it can be easily adapted for different age groups – young children can verbally tell a story using one, two or three dice and older children can write their stories. Play alone, play in groups or play as a family – either way it will have you thinking hard about how to creatively combine those shoes, a computer and that man in a hat. The Storyteller Set is US$36 and available from Romp who ship to Australia. If you fancy some more story telling ideas, check out our previous post on Story Starters.